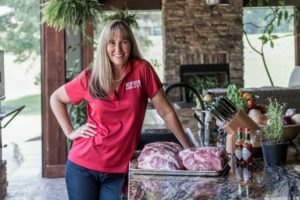 World Champion and Best Selling Author shares a few recipes guaranteed to make you the cupid of any heart! WHAT MAKES THEM MEMPHIS STYLE RIBS? BBQ “regions” are kind of loosely defined. There’s no hard and fast rules you’ll get traveling from one area to the next defining the absolute recipe that people use. Memphis style, generally, speaks to cooking pork ribs, usually loin back ribs, until they are slightly more tender than most regions. (We would say everyone else cooks them too tough!) Memphis style usually involves a sweeter dry rub and or a glaze, which is BBQ sauce with a bit of honey for sweetness and glossiness. 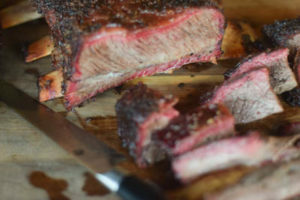 A “dry rib” which Memphis is known for is simply a rib that you shake extra dry rub on after cooking instead of a glaze. “Muddy style” is where you glaze the rib and then add the extra shake of seasoning. The Method This method for ribs is really simple. I start my smoker (in this case a Big Green Egg, but you can use whatever you have, including a grill set up for indirect smoking) and set it for 250 degrees. When I’m using a BGE for smoking or slower cooking, I do use the convection plate. I used Kingsford Professional charcoal for heat and Kingsford Apple Wood chunks for my smoke flavor. How much wood you need will really be up to the smoker you are using. A komodo style cooker only needs a few chunks. When I’m cooking on my Jambo I can burn almost all wood and not overpower the meat. Place on the smoker and allow to cook for 2 hours. You may need to rotate them depending on the size and the type of grill you are using. After two hours, get a large piece of heavy duty foil for each slab you are cooking. Sprinkle 1 tablespoon of Sweet Memphis BBQ Rub, 1 tablespoon of brown sugar, and drizzle about 1 TBS of maple syrup on the middle of the foil. Place the ribs meat side down on the foil. Repeat the brown sugar/rub/maple syrup on the bone side of the ribs. Pour in about 2 tablespoons of apple juice, then wrap in foil and place back in smoker. Place back on cooker (leaving meat side down) and cook for about two hours. Check after 1 hour, then every 15-20 minutes after for proper doneness. The meat of the ribs should be pulled back from the rib bone approximately 1/2 to 3/4 of an inch, and the rib meat should feel tender. Carefully remove from foil and place back on grill bone side down. 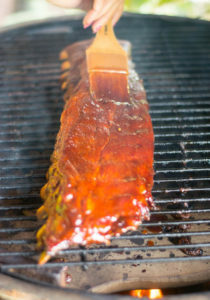 Glaze with your your favorite BBQ glaze (I use 1 cup sauce and add 1/4 cup honey to make a glaze.) Let sit on grill for 5-10 minutes to tighten ribs if desired. Serve and enjoy! The Method: Prepare a smoker to run at 275 degrees with pecan wood. Or you can set up a grill to run on indirect heat by placing all the charcoal on one side and your meat over the other side. Remove ribs from wrapping and let come to room temp for about 30 minutes. Lightly coat the meat with olive oil, then sprinkle heavily with grillin’ shake or your beef rub. Place the meat on a large piece of foil and add in 3-4 TBS of beef stock. Wrap fully and place back in smoker. Continue to cook for 1-2 hours, or until meat is absolutely soft to the touch and the bones can be removed easily. I don’t cook them to quite the soft texture as when I braise them, but you can easily do this if you prefer. Slice and serve! I adapted this recipe to run in a normal smoker or on a grill set up for indirect heat. I cooked these in my Big Green Egg which I run at a higher temp (around 325) but with the convection plate. When using my egg, I normally run higher items at the thermometer than I run in my smoker or grill due to the design of the egg. I used Kingsford Professional Charcoal supplemented with 3-4 small chunks of pecan wood for flavor.